Cast on a multiple of 10 stitches. Row 1 - right side: * Knit 1, purl 1, knit 1, purl 7; repeat from * to end. Row 2: * Knit 7, purl 1, knit 1, purl 1; repeat from * to end. Row 3: Knit 1, purl 1, * knit 7, purl 1, knit 1, purl 1; repeat from * to last 8 sts, knit 7, purl 1. Row 4: Knit 1, * purl 7, knit 1, purl 1, knit 1; repeat from * to 9 sts, purl 7. knit 1, purl 1. 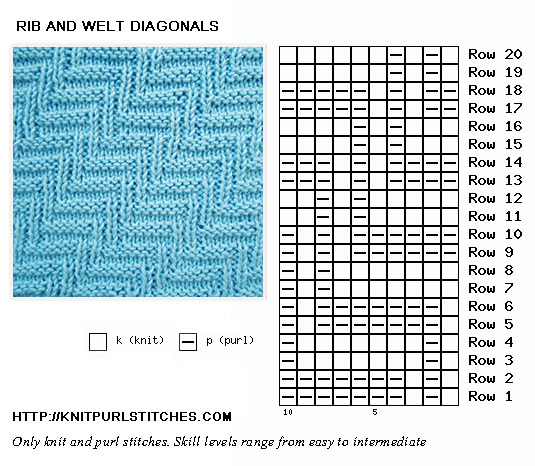 Row 5: Knit 1, * purl 7, knit 1, purl 1, knit 1; repeat from * to 9 sts, purl 7. knit 1, purl 1. Row 6: Knit 1, purl 1, * knit 7, purl 1, knit 1, purl 1; repeat from * to last 8 sts, knit 7, purl 1. Row 7: * Knit 7, purl 1, knit 1, purl 1; repeat from * to end. 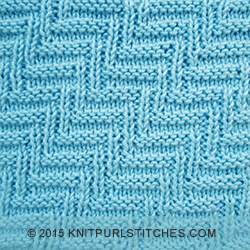 Row 8: * Knit 1, purl 1, knit 1, purl 7; repeat from * to end. Row 9: Purl 6, * knit 1, purl 1, knit 1, purl 7; repeat from * to last 4 sts, knit 1, purl 1, knit 1, purl 1. Row 10: Knit 1, * purl 1, knit 1, purl 1, knit 7; repeat from * to last 9 sts, purl 1, knit 1, purl 1, knit 6. Row 11: Knit 5, * purl 1, knit 1, purl 1, knit 7; repeat from * to last 5 sts, purl 1, knit 1, purl 1, knit 2. Row 12: Purl 2, * knit 1, purl 1, knit 1, purl 7; repeat from * to last 8 sts, knit 1, purl 1, knit 1, purl 5. Row 13: Purl 4, * knit 1, purl 1, knit 1, purl 7; repeat from * to last 6 sts, knit 1, purl 1, knit 1, purl 3. Row 14: Knit 3, * purl 1, knit 1, purl 1, knit 7; repeat from * to last 7 sts, purl 1, knit 1, purl 1, knit 4. Row 15: Knit 3, * purl 1, knit 1, purl 1, knit 7; repeat from * to last 7 sts, purl 1, knit 1, purl 1, knit 4. Row 16: Purl 4, * knit 1, purl 1, knit 1, purl 7; repeat from * to last 6 sts, knit 1, purl 1, knit 1, purl 3. Row 18: Knit 5, * purl 1, knit 1, purl 1, knit 7; repeat from * to last 5 sts, purl 1, knit 1, purl 1, knit 2. Row 19: Knit 1, * purl 1, knit 1, purl 1, knit 7; repeat from * to last 9 sts, purl 1, knit 1, purl 1, knit 6. Row 20: Purl 6, * knit 1, purl 1, knit 1, purl 7; repeat from * to last 4 sts, knit 1, purl 1, knit 1, purl 1. Repeat Rows 1 - 20.